Optimized - Lifelogging and Quantified Self Tracking Improvement App. Simply track your everyday life with Optimized and learn how to improve it. Record, analyze and improve your life with Optimized. Optimized - Lifelogging and Quantified Self app helps you record your life to improve it. Simply track your everyday activities, places you visit, people you meet, your mood and many other things. Optimized automatically translates your lifelogging data into your personal insights: How does walking affect your sleep? How does your work influence your health? How do other people affect your mood? Optimized answers all of these and many more questions to provide you with decision support and motivation in your everyday life. Optimized respects your privacy - All your data stays locally inside the app. Optimized makes tracking your everyday life simple and fun. 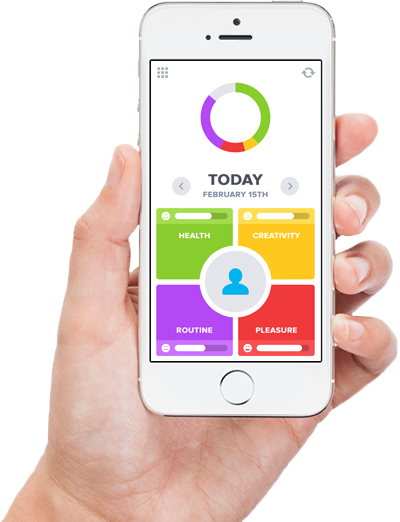 Use the intuitive interface to record your entire Quantified Self in a single app. Automatically track Steps, Active Minutes, Weather, Temperature and Moon Phase. Integrate your Lifelogging data with activity trackers Moves, Fitbit or Jawbone UP as well as any apps and wearables connected to Apple Health app. Optimized is not only about Lifelogging - it’s also about motivation and about insights. Ari, your personal life coach, will provide you with both. The more you track, the more insights you will get. And if you set a goal, Ari will make sure you follow it. Optimized is simple to use but has all the powerful tools when you need them. With a multitude of smart charts and statistics including automatic correlation mining, Optimized provides you with some of the most advanced Lifelogging and Quantified Self data visualization and analytical capabilities ever seen on mobile. Improving your life is all about setting the right goals. Whether you want to regularly go to the gym, do more creative stuff or spend more time with your loved ones, Optimized provides you with the right tools to keep your goals on track. Would you like to track your steps, calories and weight? Or do you care more about your health status, stress level and your mood? Would you like to define your own Lifelogging activities and Quantified Self parameters? It’s up to you to customize Optimized the way you need it. Be the first to get our news.